The challenge of creating local Atlanta art is what really kick-started my drive to be an artist. For those who don’t know, I started out mainly interested in capturing far away places on trips overseas. I loved to travel and still do, but generally that’s not something one gets to do every day. At the time I lived and worked in the Atlanta area and I realized if I wanted to practice as a photographer, I was going to have to turn my attention to local places. Essentially I became a tourist in my own backyard and I looked at the places that surrounded me with new eyes as a result. 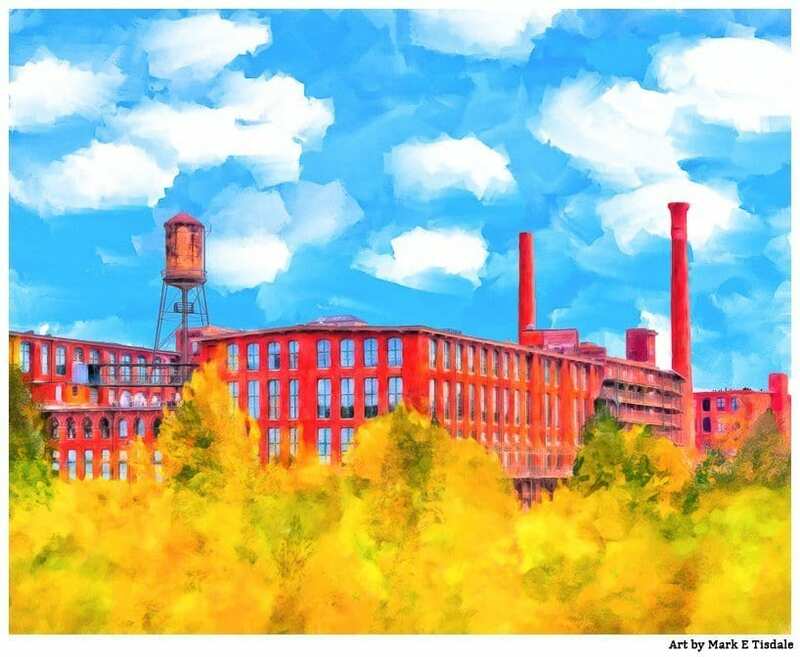 I began to seek out landmarks in a local Atlanta art series that I then referred to as my “Atlanta Icons” – places that I felt were part of the fabric and character of the Atlanta area. If you’ve ever lived there, you’ll probably guess easily that one of the first places in my collection of local Atlanta art was none other than the grandam of Peachtree Street – The Fabulous Fox Theatre. 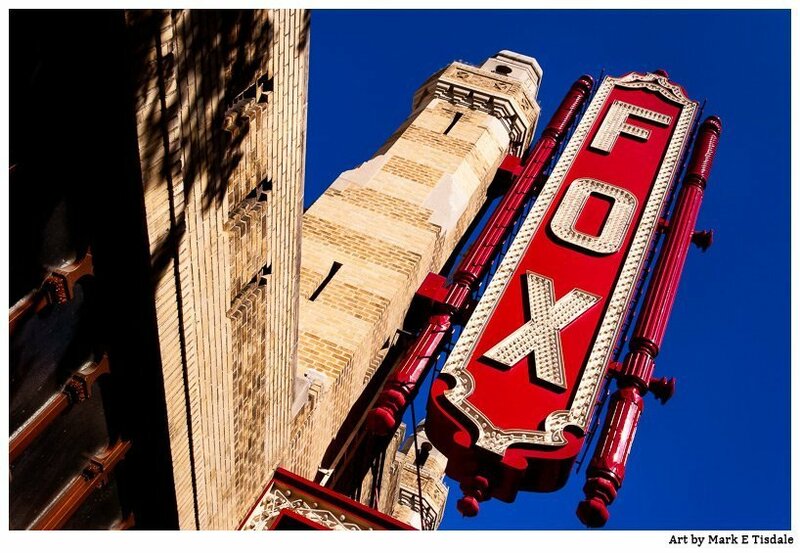 Interest in some of my other Atlanta photos from the same time has waxed and waned many times, but that early photo of the Fabulous Fox sign has been a perennial favorite among local Atlanta art buyers for over a decade now. The bright colors and the fun angle has kept people coming back. Not only was that just the beginning of my association with local Atlanta art, even leaving the city to live in sleepy rural Georgia didn’t throw cold water on my interest in creating art featuring the only big city I’ve called home. You see, beneath the surface, Atlanta still has a plenty of traditions and characterful places. And those are just the sorts of places I like to feature whether it’s in a photo or otherwise! 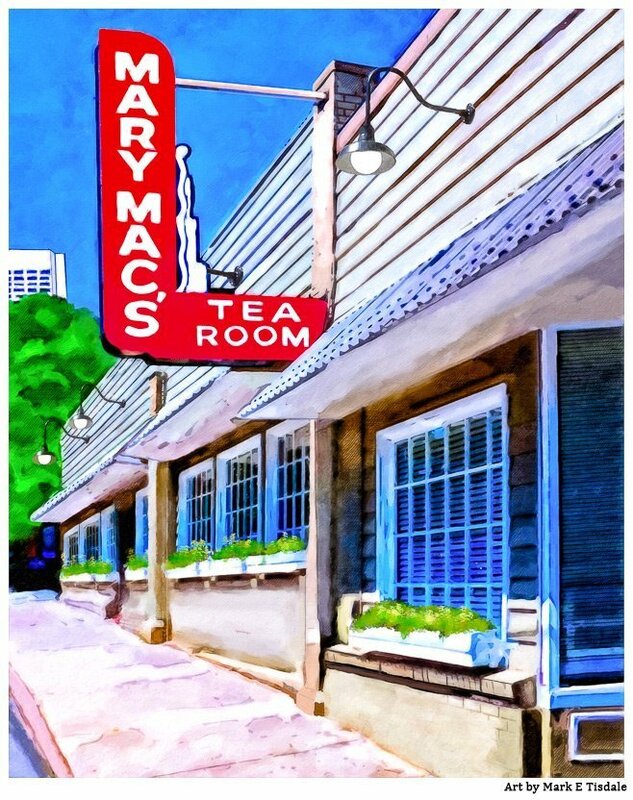 For instance, it’s hard to go wrong featuring an old landmark like Mary Mac’s Tea Room. Mary MacKenzie opened her tea room in 1945, an era when women weren’t expected to be restaurateurs but a tea room was an acceptable business. The eatery has only been through two owners since then and the southern menu there today would still be similar to what Mary Mac herself cooked up years ago. Mary Mac’s is such a venerable Atlanta tradition that it was even mentioned by Julia Sugarbaker (Dixie Carter) in an episode of Designing Women. The humble facade of Mary Mac’s doesn’t make for flashy art, but it hits the spot for people who seek local Atlanta flavor. 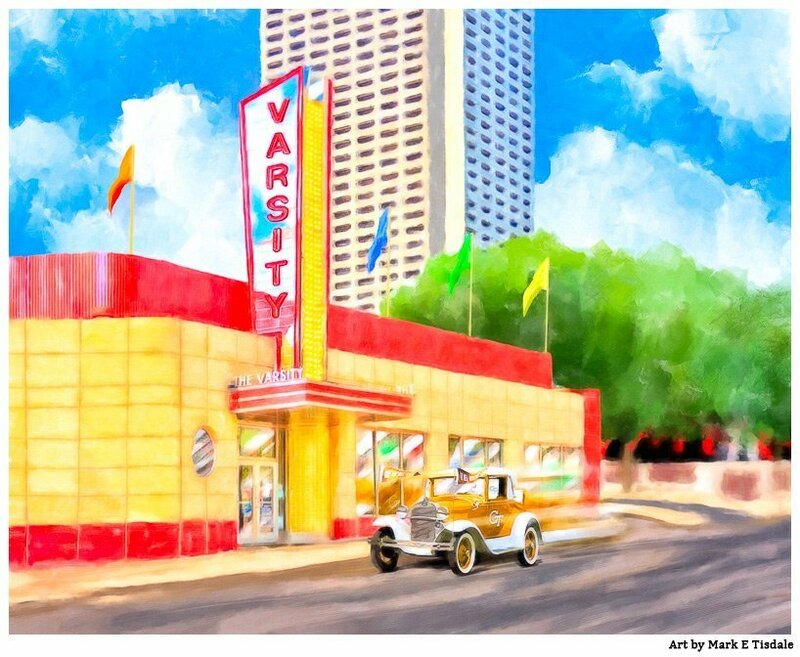 Speaking of local flavor, it would be hard to have local Atlanta art that didn’t feature The Varsity! This landmark restaurant opened to serve Georgia Tech students in the 1920’s. It’s moved once, expanded and opened in other cities since then, but it’s still a Tech tradition. And my favorite part of the Varsity as someone who loves architecture is the cool lines of streamline moderne – an Art Deco style. There are new vintage-style restaurants today that are still copying the genuine style of old restaurants like the Varsity. While we’re on the subject of food AND Art Deco style, I had a lot of fun doing this print featuring the Majestic Diner. It’s also been serving customers in Atlanta since the 1920’s. And with style no less! 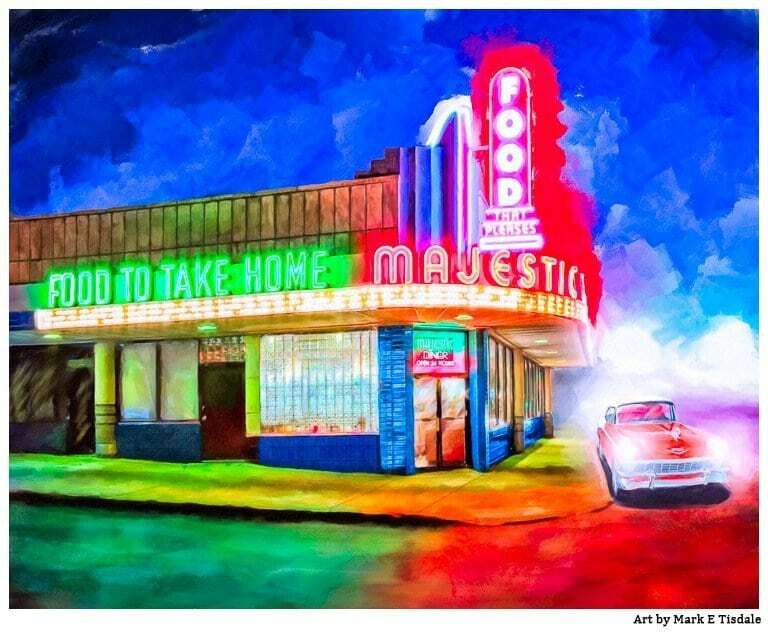 Even if the Majestic weren’t a part of Atlanta’s local culture, I would have been drawn to it just for that beautiful neon and Art Deco architecture. These are things I find visually inspiring as an artist. And there’s an almost universal appeal to a scene like this. While I think people who have called the area home are more likely to fall for this piece of local Atlanta art, I can equally see people who just love this style and tone of Americana to like it as well. At this point, you may be wondering if the only landmarks that I found appealing centered around eating! While a lot of Atlanta may be from the 20th century and onward, there are buildings surviving from the 19th as well like the historic Fulton Cotton Mill. About the time I moved to Atlanta, the lofts there were still new. In fact I believe they were still converting the old mill at the time. It was an unfulfilled dream of mine to live there. I think I would feature them among my local Atlanta art anyway, but it doesn’t hurt that I have always had a yen for the place! 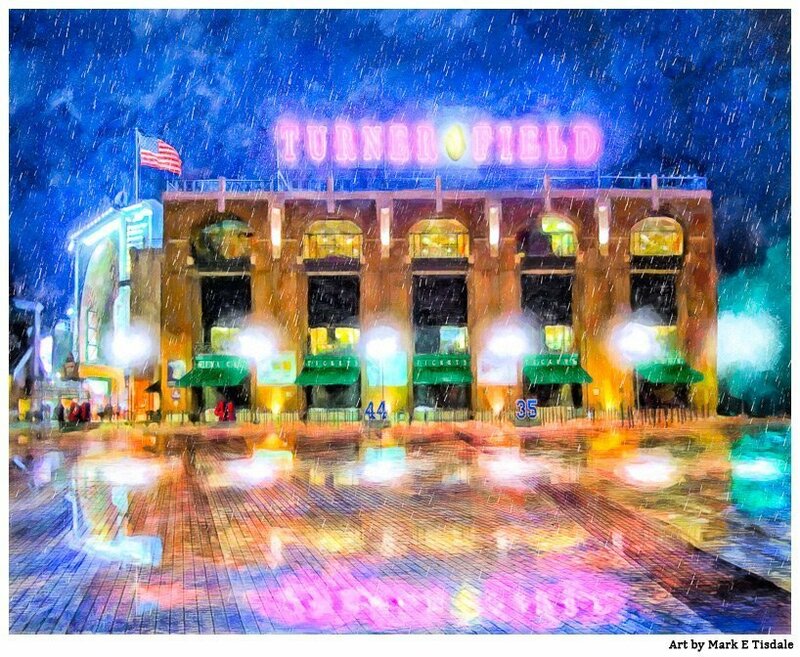 One of the most recent features from my local Atlanta art is this scene showing a rainy night outside of Turner Field – AKA The Ted. And as hard as it is for me to imagine, this is a scene from history now. The Braves recently moved to a new field, but the last place I saw them was Turner Field. And in my memory, it will always be the new stadium that opened just after the Atlanta Olympics in 1996 – only a couple of years before I moved to Atlanta. And yes, my last time at The Ted, it rained. So this felt like a fitting way to remember a little bit of Altanta’s recent past. I hope you enjoyed these local Atlanta art prints, and this is only a part of my work that features scenes in and near Atlanta. For more, be sure to check out my site. It was actually quite hard to pick what to feature here – after you’ve had a chance to look at the rest of my Atlanta art, I hope you’ll share your favorites! Maybe I’ll feature them in a future post. And although I have plenty of Atlanta subjects for future work, I also welcome your suggestions for more Atlanta themes I should explore.